Caitlín R. Kiernan is an enormously prolific author. The Dinosaur Tourist is her 13th short story collection, and she’s published a further 14 novels. In this body of work, we see a rarity: a writer making a living through sheer productivity. Not every writer can be bestselling, and few writers today can make a living. The Dinosaur Tourist is a tour in itself: the working pace and story placement of a living genre writer. This is a book unashamed of being collected production. While all the stories are “dark,” they encompass fantasy, science fiction, and horror. They are arranged near chronologically, 2013–2017. Each tale is followed by a note on its origins, authorship, period, and publication history, leaving the reader with a sense that Kiernan is annotating her own career. The best parts of The Dinosaur Tourist involve Kiernan’s reinterpretations of Lovecraftian mythos. Most of these stories are based, like Kiernan herself, in Rhode Island. Though not part of Lovecraft’s traditional territory, Providence lends itself to the genre’s sea-going sense of dread. Old houses and fishing nets combine with the characters’ crawling anxiety to evoke a place caught between ancient and too-modern versions of the world. The narrator might prefer that, too, but she has a deep and intimate, though never fully developed, knowledge of the act. This, like many of Kiernan’s stories, has enormous potential not fully explored. Objects lurk, full of significance, as though the story were the first chapter of a novel and not a self-contained tale. “Far from Any Shore” carries the same sense of being the shell of a larger, unseen story. A midwestern paleontological dig reveals an object that might be accidental in formation, or might be a Cthulhu Venus, calling up the horrors of the deep to the plains. This reimagining of Cthulhu as female isn’t Kiernan’s alone; it swirls within modern Lovecraftian horror, part of the work writers undertake to dismantle Lovecraft’s misogyny (and, more occasionally, his racism). But gender is inescapable in Kiernan’s writing. While many authors use the feminine as a source of horror, Kiernan side-steps that line of terror in favor of a fiction that centers female characters and normalizes lesbian relationships. The stories are never pointed about the characters’ sexuality. Rather, that sexuality is comfortably present, as embedded in the universe as centuries of heterosexual desire. The most complete piece in the book, and perhaps the most satisfying in its own right, is “The Cats of River Street (1925),” a deliberate Lovecraft tribute. The horrors of the deep lurk through most of the story without disrupting human life. The battle between Old Ones and mortal life is fought at night, by cats feral and domestic. Cults and monsters shape the town, but go unnoticed. Though the story never fully crosses into allegory, there’s an urgency in this tale of a community on the edge of environmental oblivion, never noticing its imminent annihilation, distracted as it is by its own psychic and domestic dramas. Not every piece is as successful as these. The “Murder Ballads” hurtle through their dark stories as single, multi-page paragraphs, merging dialogue, narration, and ambient fear without a pause for breath or attention. “Whisper Road (Murder Ballad No. 9)” mixes bloody outlaw lovers with unearthly terror, but its form makes the story frustrating, difficult to read and follow. Readers are likely to give up partway through, uncertain of the progress of events and the possibility of an ending. “Fake Plastic Trees” has a simplicity of characterization and plot that speaks to its origins as young adult fiction, out of place in this deeply adult book. “Ballad of an Echo Whisper” offers New Orleans heat, but its story never quite gels around the discomfort and tension of the weather. “Untitled Psychiatrist #2” keeps its discomfort buried within something autobiographical that Kiernan references but never reveals. 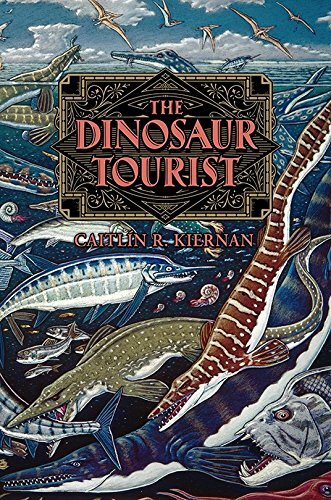 The Dinosaur Tourist is a volume for Kiernan’s fans. Her work is far-reaching, ambitious, and urgently queer. While the collection is uneven, it contains magnificent work worth diving into, even at the risk of drowning or being devoured.